Nintendo has been stepping up the digital downloads for their Club Nintendo service over the last several week by offering more games for a shorter amount of time – instead of having a couple games available for one straight month, they have been breaking it up by offering a new game every couple weeks. This allows for more flexibility and should appeal to a wider audience. Just a few weeks ago, Bonsai Barber, the WiiWare haircutting sim, was available for 150 coins and Golf, the original GB title, was available for 150 coins from the 3DS eShop. And a couple weeks before that, Starship Defense was available on DSiWare for 150 coins for a two week span. 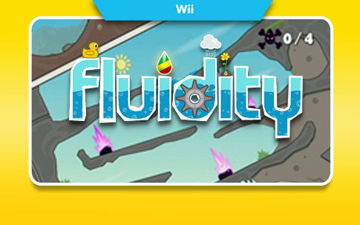 Fluidity is a WiiWare download and will available until August 19 for 150 coins. From a 2D sidescrolling perspective, the player must guide a pool of water through obstacles to reach the end goal. In short, replace the marbles from Marble Madness with water and you will have an idea of how the gameplay works. And if I am not mistaken, I believe there is a demo for Fluidity on the WiiWare service so you can try before you buy. 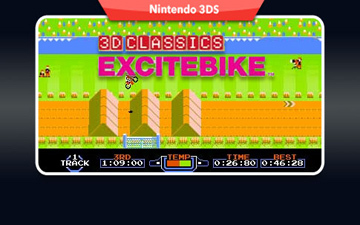 3D Classics Excitebike will be available until Aug 26 for 150 Club Nintendo coins. This is basically the NES game but has been modified to support the full 3D option of the 3DS hardware. You can also create, and more importantly save, your customized tracks. This release also goes hand in hand with Excitebike World Rally for WiiWare which was available in April via Club Nintendo. Nintendo seems to be taking their Club Nintendo digital offerings more seriously by using this “more games but less time” motto. And to be quite honest, I like it. Instead of waiting a whole month for another 2 or 3 games, I would rather have access to more content in a smaller window of opportunity. Including unique games like Bonsai Barber and Fluidity into the program is also a step in the right direction… even though Fluidity was available through Club Nintendo back in January. 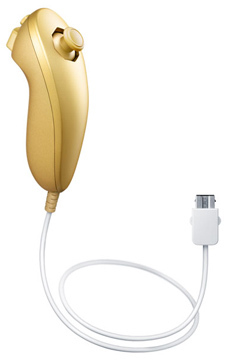 But if digital downloads are not your thing, then you can save up 900 coins and purchase yourself a gold nunchuk to match the limited edition Skyward Sword controller. Available for a limited time only, this piece will probably fetch a decent penny on eBay someday. Unfortunately, the white cord just does not look right! Looking forward to the next batch of games.